AC/DC have finished recording their new album, according to US radio host Eddie Trunk. Rumours have been swirling since August last year, when estranged members Brian Johnson and Phil Rudd were photographed together outside the Vancouver studio where AC/DC recorded their last three records. Nothing had been heard since then until late last month, when US band Terrorizer said they had bumped into Johnson at an airport, with the vocalist reportedly admitting to them that he was back in the lineup. Now, on his podcast, Trunk says that while at the recent NAMM Show in Anaheim, he was told the album is done – and it features some material recorded by the late Malcolm Young. Trunk says: “I have a source that will remain nameless, but a very, very, very well-placed, reliable source regarding AC/DC. 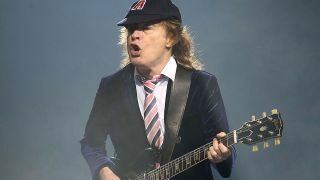 “He told me, to his knowledge, the album is done, that they went to that studio in Canada and made this record and what people speculated on – that these were riffs and ideas and is more of a tribute to Malcolm Young – is true, that Malcolm had a bunch of stuff recorded that they worked off of and incorporated into the record. “This is a unity thing – to come together and put out some of Malcolm’s music and celebrate AC/DC." Trunk adds: “This source also told me that he doesn’t know what they’re going to do with this record, when or how it’s going to come out and, as far as he was aware – and he would know – there’s no plans for live shows. The rumours regarding no live shows appears to be backed up by former Guns N’ Roses manager Alan Niven who, according to the Appetite For Distortion podcast (via Alternative Nation) says: “I’m not sure that Brian, that his condition, is going to let him tour. That is the rumour I’ve heard. Johnson was forced to stop touring with AC/DC in 2016 under the threat of permanent deafness but has since worked with audio experts Asius on a solution to his hearing problems, with Beano taking to the stage following his departure from AC/DC with Muse, Paul Rodgers and Mick Fleetwood.